1. Preheat the oven to 190°C, gas mark 5. Pat the chicken thighs dry on kitchen paper and halve each one. Put in a large roasting tin with the onions and fennel. Drizzle with 2 tbsp of the oil and a little seasoning and bake for 45-50 minutes or until the chicken is cooked through, the juices run clear and there is no pink meat, and the vegetables are lightly browned. Turn the ingredients in the oil a couple of times during cooking so they brown evenly. 2. Meanwhile, cook the broad beans or peas in boiling water for 3 minutes, drain. Combine the remaining olive oil with the chopped anchovies, garlic, vinegar and two-thirds of the parsley. 3. 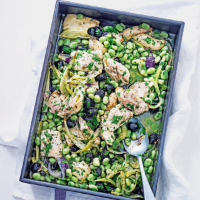 Tip the beans, olives and dressing over the chicken and vegetables and toss all the ingredients together well. Return to the oven for a further 5 minutes. Scatter with the remaining parsley and serve with the bread.